Amazon Price: CDN$ 34.99 (as of February 13, 2019 6:15 pm - Details). Product prices and availability are accurate as of the date/time indicated and are subject to change. Any price and availability information displayed on the Amazon site at the time of purchase will apply to the purchase of this product. 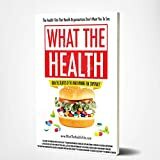 What the Health is the groundbreaking follow-up film from the creators of the award winning documentary Cowspiracy. The film follows intrepid filmmaker Kip Andersen as he uncovers the secret to preventing and even reversing chronic diseases – and investigates why the nation's leading health organizations don't want us to know about it. With heart disease and cancer the leading causes of death in America, and diabetes at an all-time high, the film reveals possibly the largest health cover-up of our time.